Big brands such as Mulberry, Giorgio Armani, Gucci and Prada face losses from the collapse of House of Fraser. They are listed in documents from administrators EY showing suppliers are owed £484m of the total debt of £884m. Among those listed is the warehouse operator at the centre of a dispute with the new owner which has led to the cancellation of all on-line orders. Mike Ashley's Sports Direct bought the chain just hours after it went into administration a week ago. Sports Direct is not legally obliged to pay suppliers money owed before its £90m buyout as their debts were part of the administration. Warehouse operator XPO Logistics is owed £30m and stopped processing orders last week because of a payment dispute. 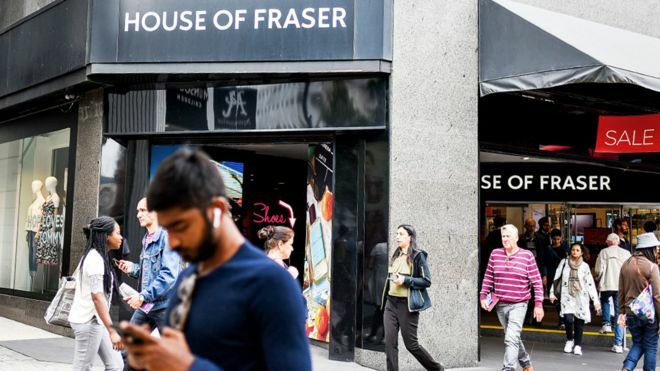 After an outcry from customers who had not received goods orders on line, House of Fraser said it would refund customers and also cancel all online orders. On Wednesday, House of Fraser took its website offline as deliveries began to back up. XPO operates two warehouses, in Northamptonshire and Buckinghamshire, that handle House of Fraser's deliveries to stores as well as customers.